Rubber Room Ramblings: DEAR HEART NOW AVAILABLE! 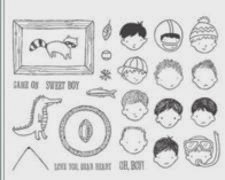 Remember the Sweetie Pie Photopolymer Stamp Set Stampin' Up! released that was very quickly sold out? Well, this is the "boy" version of that very popular stamp set. If you want this stamp set (and who wouldn't), you need to order it early, as I have a feeling it won't last long. ORDER DEAR HEART STAMP SET HERE 24/7!